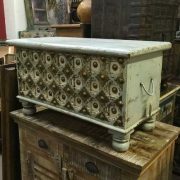 A small storage trunk hand painted all over to show Indian scenes. A striking small storage box that’s been handpainted all over. 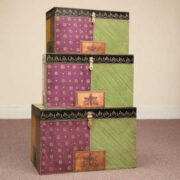 The front and sides are painted a rich deep green colour, and decorated with a traditional Rajasthani pattern. The Lid features a painted scene of three figures – an embracing couple and another woman on an Indian landscape, in a modern semi classical style. Lovely unique storage for the right owner. This item has been hand painted by local Artisans in the city of Jodhpur, India. Our painted furniture is all hand painted by extremely skilled artisans in Jodhpur, India. 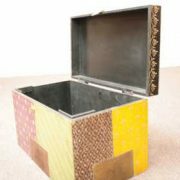 Each item has intricate designs and patterns using many vibrant colours to create a stunning feature in your home.